Five strategies and 17 mix-and-match dishes for a delicious, stress-free and beautifully organized holiday, with recipes from the F&W Test Kitchen. 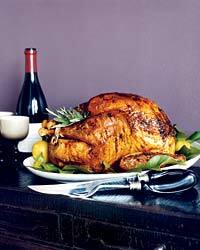 A Thanksgiving turkey can monopolize the oven for hours. You can choose to wait, or you can leave that bird alone and use other appliances to keep cooking—baking the stuffing on the grill, say. When the bird is ready, the rest of the meal will be, too. Dishes can be made ahead and frozen for up to a week. Prepare dips and salads at least one day in advance. It can serve as a second oven or stovetop. Make side dishes that don’t compete with the turkey for oven space. Since the turkey cools for 45 minutes, there’s time to make sides and dessert in the oven.